What is asbestos and should I be concerned? Asbestos is a name given to a group of minerals that separate into strong microscopic fibers that are both heat and chemicals resistant. Asbestos tends to break down into tiny fiber fragments that can remain suspended in the air for long periods of time and can e easily inhaled. Because of their durability, these fibers can remain in the body for decades causing lung scarring and cancer. Asbestos is in and on virtually every home and building in the United States. Asbestos is commonly found in: linoleum type flooring, vinyl floor tile, texturing compounds, textured paints, caulking, gaskets, pipe insulation, construction adhesives, acoustic tiles, spray applied insulation, plaster, stucco, wall board, roofing materials, exterior sidings, concrete shingles, appliances, protective clothing, etc. Government regulations exist stating materials are first assumed to contain asbestos, and can only be considered “non-asbestos” after testing by a qualified environmental laboratory. 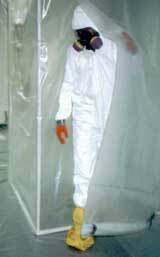 Both EPA and OSHA have rules that mandate asbestos surveys PRIOR to conducting activities that would disturb asbestos. In fact, a myriad of Federal, State, & Local regulations exist that govern asbestos from “cradle to grave.” However, many materials in a building can be shown to be non-asbestos by proper testing and documentation. Furthermore removal is not always necessary, and options can be presented that will effectively manage asbestos in-place. Because of the health hazards associated with asbestos, litigation, has resulted in astronomical losses to industry. Such civil penalties have been assessed regardless of a defendants compliance with existing legislation.